One year ago today, our final 😪 Semper Fi Siberian litter was born. Robin sent us several photos of Hatch who came from that litter. It is difficult to believe these precious bundles of joy are now a year old. Handsome Hatchie on his birthday. Hatch and his sister, Cholula, watching the birds. During this year, several of my blog followers, and especially those of you who have one of our babies, have contacted me asking for suggestions of another breeder. I have tried to help each of you with suggestions. I have not heard back if any of you were able to adopt another precious Siberian. Because I still continue to receive requests for recommendations, I would greatly appreciate if you would let me know your experiences with other breeders. And, of course, we would love to see photos of your new kittens! As a side note, I am currently spending a week in Fort Myers with my daughter. She kindly agreed to join me for my 6 month check-up with Dr. Gorovoy (the very best eye surgeon in the world!). Great report: both of my transplants are doing well. I now have 20/20 vision in my right eye and not quite that but definitely great vision in my left eye. I only need glasses for reading. I praise God for the miracles of medicine. Hope for Humankind—Predator and Prey Living in Peace! The wonderful story of two Semper Fi Siberians, Felix and Fiona, and their new “friend”, a rabbit named Penny. Predator and prey can be friends and live in peace! We adopted a 4 year old New Zeland rabbit named Penny who needed a home because two of her family members allergies were too bad to keep her. They found her four years ago abandoned under their grandfather’s deck barely alive. They took her in and got her well and loved her. The allergies are just too bad now to keep her so my friend Tracey, who knows an animal sucker when she sees one asked me to take her. At first I say no way, you know we have two cats and rabbits are prey to a cat!! I read about domestic cats and rabbits are able to cohabitate so I said I would try but no promises and she will have to go back if they attack her. Well, it’s been two months now and we had absolutely no problems. Felix and Fiona won’t play much with her but have never attacked her. Just been inquisitive, walk up to her and then walk away. I even caught Felix licking Penny a few times and my heart dropped. Hopefully within a few more months they will all be best friends. Maybe there is hope for human kind when predator and prey can live together in peace. Thank you Gina, for sharing this beautiful story with us. I do have hope for humankind! Essential oils, aromatherapy, and potpourri in your home may be pleasant for you, but natural compounds in these fragrances can be dangerous for your cat. Take precautions when using these products so your cat does not have a toxic reaction. If your cat has any liver impairment, it may be best to eliminate these products from your cat’s environment. Years ago, certain essential oils were considered to be safe for cats and were recommended for such uses as treating ear mite infestations, upper respiratory problems and for stress relief. In recent years, however, compelling evidence has accumulated that essential oils can be toxic to cats, whether taken internally, applied to the skin, or simply inhaled. The liver is most often the organ which is affected by essential oils. Cats’ livers are simply not the same as humans’ livers. Cats lack certain enzymes that provide the ability to properly metabolize the various compounds in essential oils, phenols in particular. These phenolic compounds occur naturally in some plants and are highly concentrated in essential oils. Exposure can lead to serious liver damage, liver failure, seizures, or even death for cats. The higher the concentration of essential oil, the greater the risk to your cat. If your cat ingests any oils accidentally, go to the veterinarian immediately. Cats absorb oils that are directly in contact with their skin. Oils diffused in the air are inhaled and also collect on the fur, which results in your cat ingesting them during licking and cleaning. Toxicity can occur very quickly or over a longer period of exposure. If you notice any of these signs, take your cat to a veterinary emergency center. The veterinarian may note low heart rate, low blood pressure, and signs of liver failure. Although it is now discouraged, some people treat their cats with essential oils for various problems. You should only do this under the direction of your veterinarian. Even then, you must take precautions that the oils are appropriately diluted and only use the concentration recommended. Be aware that products often vary in concentration from what may be listed on the label. Your cat may be exposed to essential oils you use for your own purposes. Keep any essential oils in a cat-proof cabinet so your curious pet doesn’t have access to them. Passive reed diffusers or potpourri pots can be knocked over, exposing your cat to the oil-containing liquid. Don’t allow your pet to lick your skin if you have applied any products that contain essential oils. Essential oil and aromatherapy diffusers, candles, liquid potpourri products, and room sprays are sources of airborne essential oils that cats can inhale or lick off their fur. If you can smell the fragrance of the oil, there is oil in the air and it can affect your cat. Kittens, elderly cats, or cats who have liver or respiratory problems should be kept out of any room where essential oil diffusers are used. Don’t wear aromatherapy jewelry when you are around your cat. In addition to scents’ toxic effects, some scents can irritate your pets in other ways. Cats and dogs have much stronger senses of smell than humans, and their noses are much more sensitive. What can smell wonderful to you can be overwhelming to your cat. If you use home fragrances, it’s important to have a place that is scent-free so your pet can retreat when it gets too overpowering. Hydrosols are often touted as a more natural, safer alternative to essential oils. Hydrosols are also known as “flower waters.” They are less saturated than essential oils. They are the water that remains after steam-distilling flowers or herbs in water. While hydrosols are safer for use on human skin, since they do not have to be diluted, they still are dangerous for cats and other pets. The water can hold on to residual matter from the plants that can be toxic if ingested or even inhaled. Some pets can tolerate hydrosols, but others are more sensitive. Limit your pet’s access to them and their scents to minimize the risk of any health issues. While aromatherapy can be helpful in managing your stress or other conditions, they can be toxic to pets. Take precautions to protect your pet and keep them away from harmful essential oils. You may have been wondering why there have not been any recent blog posts. Without going into detail, there are circumstances that must take priority at this time. Do not worry; my physical health is fine and after my recent corneal transplant, I am seeing with a clearness I never realized possible. From time to time I run across articles that I want to share with you but find I do not have the time or energy to write a full blog post complete with the kitten/cat photos you so enjoy. So rather than not sharing at all, I will share these articles in the hopes you will read them and they will be beneficial to you. As with other times in life, this too shall pass, and it won’t be long before I am posting photos of our beloved Semper Fi Siberians enjoying life if their forever homes. We have a feline obesity epidemic in this country, and one of the reasons is because our indoor cats are overfed couch potatoes. Just because kitties are more independent than dogs doesn’t mean they don’t need the tools and motivation to get regular heart-thumping exercise. Your cat, while domesticated, has maintained much of his natural drive to engage in the same behaviors as his counterparts in the wild, including hunting for food, which also happens to be great exercise. A great way to do that with an indoor cat is to have him “hunt” for his meals and treats. Separate his daily portion of food into three to five small meals fed throughout the day in a variety of puzzle toys or indoor hunting feeder mice. You can also hide his food bowls or food puzzle toys in various spots around the house. Climbing, scratching and stretching are natural feline activities that help keep their bodies well-conditioned and their minds stimulated. Indoor cat trees should ideally reach from floor to ceiling, be very stable (not wobbly) and covered with a variety of cat-tractive materials to entice kitty to climb, stretch and claw. If you can place your cat tree near a window, even better. Cats also enjoy climbing to high perches to watch the world from a safe distance, so make sure the cat tree has at least one. You can also add wall shelves and window seats to give kitty a range of choices. Providing your indoor cat the opportunity to experience the outdoors safely provides both physical and mental stimulation without the risks of free roaming. It also gives her an opportunity for beneficial grounding. Many cat parents are creating safe outdoor enclosures or cat patios — catios — that allow their feline family members secure access to the outdoors. The enclosure should be open air, allowing kitty exposure to fresh air and sunlight, but shielded enough to prevent escape or a predator from gaining access. Another way to get a willing cat outdoors in nice weather is to walk him on a harness and leash. This obviously won’t be the answer for every cat, but if you feel yours might enjoy going for walks, here are 10 tips for training a cat to walk on a leash. These little mouse toys are also a hit with most cats. They’re not the real thing, of course, and your kitty knows it, but they’ll do in a pinch. Cats seem to like the size, texture and “battability” of the mice. Try flicking one across the floor in front of your kitty and see how she reacts. Many cats think it’s great fun to chase and swat bubbles floating in the air! Some kitties go wild for catnip, so a catnip toy can be an ideal way to get your kitty in the mood for some interactive playtime. When a susceptible cat (not all cats are affected by catnip) absorbs the nepetalactone in the herb, her pleasure centers in the brain are activated and the next thing you know, she’s rolling around in a state of goofy bliss. And despite the fact that catnip appears to make kitties “high,” it’s an entirely harmless and non-addictive herb. When cats in the wild feel threatened, they head for trees, dens or caves to seek safety. Captive kitties don’t have that option, so their obsession with hiding in boxes may be an adaptation. And studies show access to hiding boxes reduces feline stress, especially in shelter cats. Many cats also use hiding boxes as cardboard jungle gyms and spend time playing in and around them. Can You Afford a $5,000 Pet Emergency? What would you do if your dog or cat needed medical care or surgery that cost $5,000 to save his life? Could you do it? Many pet owners can’t afford that kind of veterinary bill. You may want to provide the best care for your pet, but after all the other bills — including mortgage or rent, groceries, credit card bills, and more — there just isn’t a lot left. That’s why I believe in pet insurance. Pet insurance allows pet owners (you) to do the best for their pets when an unexpected emergency or expense occurs. Over the past two decades as a veterinarian, I’ve worked with several different pet insurance companies and I’ve seen how having insurance allowed pet owners to really do the best for their pets when they would otherwise not be able to afford treatment. A lack of funds can lead to a decreased quality in care or, even worse, opting for euthanasia when treatment could have helped. Clients commonly ask questions about pet insurance so I’ve spent time over the past 20+ years researching the different companies. I recently worked with the pet insurance company Pets Best and there are several things I really like about them. Like PetPlace.com, Pets Best was founded by a veterinarian passionate about pet health and well-being. I’ve found that Pets Best is one of the most affordable, comprehensive, and well ranked pet insurance companies on the market. They are veterinarian owned, just like PetPlace.com! They know what it means to provide good care. If you want to do the best for your pet, one thing I really recommend for my patients and friends is pet insurance. One of the biggest benefits of pet insurance is that it provides peace of mind when you need it the most. In case of an emergency, bills are just one less thing that you need to take care of. P.S. You would never let your children go without health insurance, and in my opinion our pets are just like our kids. Take five minutes to learn more and find out if pet insurance is right for you. Go to PetsBest.com and get a free quote. A wise lady once told me, if you want to be happy, organize your life in this order: God first, family second and career third. 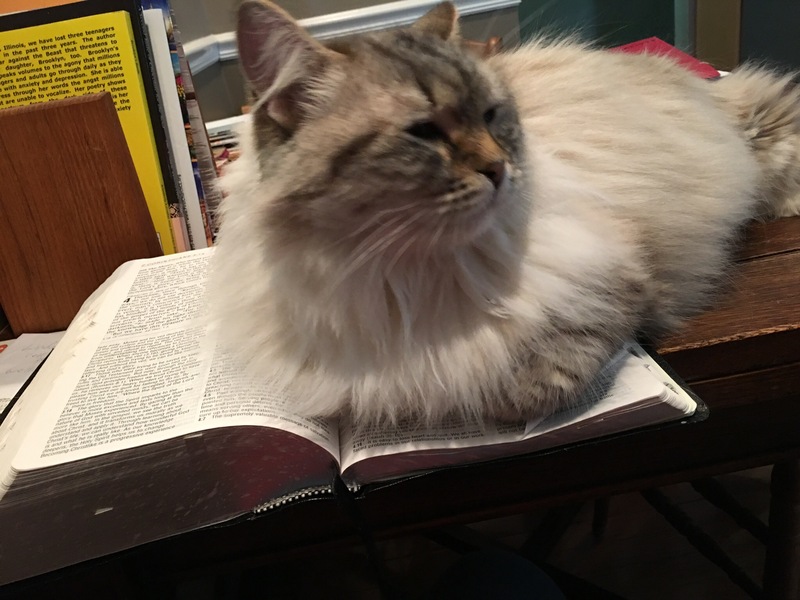 Sophie likes to join me in my morning bible study and prayer time. I have been notified three times this week by the FDA with regard to recalls on pet food. The one that is making the biggest news concerns pet foods containing pentobarbital which is a drug used to euthanize animals. I feel so fortunate to be affiliated with a pet food company that cares. (Mrsilversfood.com)I was notified by Life’s Abundance they would conduct a webinar today for their field reps with regard to this problem. I tuned in and am very glad I did. Brands in the current recall are produced by Big Heart Pet Foods which is owned by Smuckers. There is an entire list in the following article published by the FDA. A partial list is: Gravy Train, Kibbles and Bits, Skippy, Ol’ Roy, Evangers. Pentobarbital slows activity of the brain and nervous system. In low doses it can cause drowsiness, dizziness, excitement, loss of balance, nausea, eyes moving back and forth. In high doses it can cause coma and death. How does it get into pet food? You are not going to like the answer! One possibility is that animals euthanized are then rendered and used in animal products. Although small amounts may not cause severe problems, federal regulations stipulate that it is illegal for any pentobarbital to be contained in pet foods. And it has been illegal since the 1990’s when it was first identified in pet food. The lady conducting the webinar asked all of us to notify anyone we know who are using these products to stop immediately. I wish I could say there is no way any of our pet parents are using these products. But sadly, I cannot. I really do not understand why anyone would stop using Life’s Abundance. You cannot separate the products from the company. Life’s Abundance is different from other companies. They use premium ingredients. Before selecting a supplier they do their due diligence. They use premium delivery. Each product is made in small batches, quickly packaged and sent to the distribution centers which they own and control. When a customer orders the product, it is delivered to their door in a matter of a couple of days. When this company was formed, they decided this is the way it should be distributed rather than having it sent to warehouses and stores where there is no control over how it is handled. There are three service options available to every customer. L/A provides 100% open communication. As a field rep, we are your first line of communication. Next, the customer care reps are highly trained and are always there to help you. Thirdly, anyone in management is available to you. If L/A ever had to do a recall they have a record of every batch and who it is sent to. You would be contacted within one day! The above article tells stores to contact purchasers of these products that are being recalled. Really? Does the manager of Walmart know you purchased Gravy Train during your last visit to his store? We take safety seriously. This is an employee owned company. Everyone of us feeds our pets L/A products. And if that isn’t enough to convince a person of the quality of this company, a percentage of every purchase you make goes to the Dr. Jane foundation who distributes funds to worthy pet help facilities and shelters. Our three cats and dog love Life’S Abundance. If you have switched to another brand, please switch back and if your pet has never tried it, go to mrsilversfood.com and learn all about this great company and their great products! Zeke is an Australian Shepherd/Border Collie Mix who we adopted from a shelter in 2007. Here he is in his Florida cut—it’s hot down here! Sophia is our beautiful Seal Lynx Point Siberian who is 6 years old and enjoying her retirement from breeding. But she does miss all her babies as we do too! This is Magdalena who is our golden mackerel tabby Siberian who will be 4 in June. She has become very playful in her retirement. How about that tail when she’s looking in the refrigerator! Thank you Katheryn for sharing these photos with all of us. I am hearing lots of stories of cold weather and snow in Illinois and other parts of the country. Hope you are staying warm and safe. It is 83 degrees today in Fort Myers with 0% of precipitation. Wish you could join us! Maybe during spring break? Our beloved pet parent, Gina, just sent us this adorable video. Even if you have no desire to watch the Super Bowl, you will enjoy Felix and Fiona watching the Kitten Bowl! And yesterday, Maggie and I enjoyed this video sent to us by Pastor Mary Alice. I hope these two videos brought a smile to you face and warmth in your heart because that is what Siberians do!